The suspect police are searching for. A 78-year-old woman fell and hurt her hand and knee after a thief grabbed her purse in Brooklyn, police said. 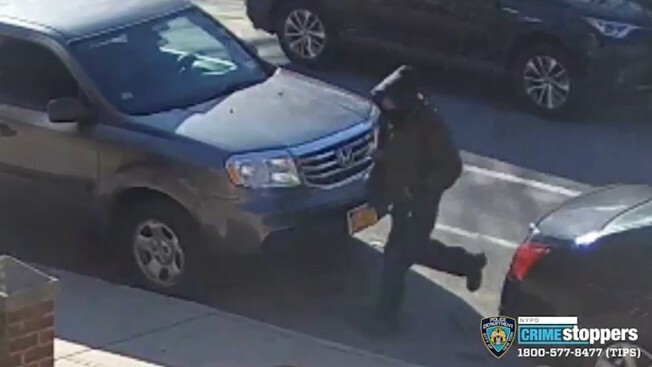 The woman was walking at the northwest corner of Fort Hamilton Parkway and 90th Street in Bay Ridge around 4:45 p.m. on Sunday when the thief approached her from behind and grabbed her purse, the NYPD said. The woman tried to hold onto her purse, but the thief managed to wrestle it from her hands after she fell to the ground, according to police. The thief fled south on Fort Hamilton Parkway and eventually tossed the purse after stealing a credit card and $60 in cash. The woman was left with swelling on her right hand and a minor injury on her left knee, but refused medical attention, the NYPD said. Police are now searching for a male thief, who was last seen wearing a green waist-length jacket and a hooded sweatshirt. Anyone with information about this incident can call NYPD's Crime Stoppers Hotline at 1-800-577-TIPS.